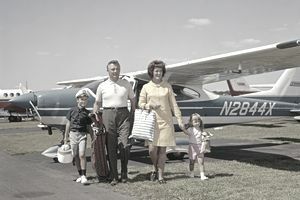 Purchasing an aircraft for personal use is no small matter. Now that you've gone through your flight training and are deemed competent to man a piece of aircraft you'll need to take the next important step. And this step can be very costly if you've not done your homework. Variable costs, like fixed costs, are important to determine before buying or operating an airplane. But unlike fixed costs you may be familiar with such as financing, insurance, and hangar rental, etc., these variable costs can be a bit harder to determine. Determining both fixed and variable costs ahead of time is essential for aircraft owners to determine your potential budget as a potential aircraft owner. Variable costs are defined as costs that go up or down depending upon the usage of the airplane. For example, as the aircraft usage hours increase, the variable cost will increase as well even though the cost per unit stays the same. For example, the more hours that fly your airplane, the higher the total fuel cost will be. Therefore, fuel is a variable cost. Crew salaries, if paid per flight hour. When crew members are paid on an hourly, the cost incurred is a variable cost. Conversely, when crew members are paid an annual salary, the cost is considered a fixed cost. Maintenance. Most aviation organizations consider all maintenance costs as variable costs. Some, however, consider certain aspects of aircraft maintenance as fixed costs. Annual inspections, for example, are typically scheduled and must be completed whether the airplane flies ten hours or 1,000 hours per year. It leads some operators to consider this type of maintenance a fixed cost. The same can be true of scheduled overhauls and avionics updates. These costs can be considered fixed costs because they don’t necessarily change with aircraft usage. However, regular or unscheduled maintenance costs tend to vary due to the fixed cost per unit (i.e., the hourly rate a maintenance facility might charge). Logically, the more an airplane flies, the more maintenance hours will be required to maintain it. It's important to note that the more hours you fly an airplane, the less you'll be paying per hour for your variable costs. There's another variable to measure, and that's the cost per nautical mile. A jet, for example, will have a much higher cost per hour than a piston aircraft, but it can also deliver you much farther in far fewer hours, so you'll spend fewer hours in the air for the same trip. If you're in the market to purchase your first airplane, it would be wise to talk to current owners of the same aircraft to get an idea of their planned costs, actual costs, and usage. Also, an aviation consultant company like Conklin & de Decker can be helpful as well as aircraft owner industry groups such as AOPA or check out the EAA.